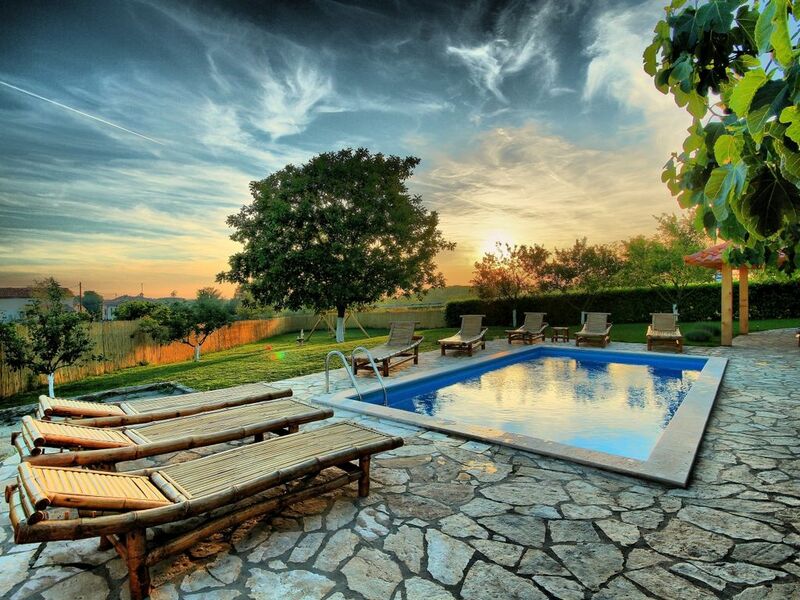 Villa Blaz is located in the village Basici near Tinjan in central Istria, 18 km from Porec and the beaches. The house was built in 1985 and renovated in 2013. On its own enclosed property of approx. 2800 sqm offers the Villa Blaz a wide range of facilities for children and adults: swimming pool of 25 sqm, covered terrace with barbecue and dining table, terrace with sitting furniture, outdoor children playground, badminton, table tennis and three parking places. Villa with pool for 10 persons with a total living area of 280 sqm consists of two houses. The large house consists of ground floor in which is located an air-conditioned living room, fully equipped kitchen with dining table, double bedroom, bath/toilet, bedroom with two separate beds, shower/toilet. On the first floor there is an air-conditioned living room with access to the balcony, equipped kitchen with dining table, two double bedrooms of which one with access to the balcony, double bedroom with bunk beds, shower/toilet. In the smaller house on the air-conditioned ground floor there is a kitchen with big dining table, double bedroom with own closed terrace, shower/toilet.